Forcing yourself to go the library at the end of a tough day of classes can be incredibly dreadful. Thanks to UW-Madison’s huge campus, there are more places to study than you may think. Instead of spending hours on end at your typical libraries, check out these secretive (and underrated) study spots for a change of pace. Decked out with hammocks and comfortable couches, Upper House is certainly not your ordinary study spot. Conveniently located on East Campus Mall, this is a great spot for a change of scenery. Perfect for completing a reading assignment while lounging in style, or you can book a private room to crank out your work. 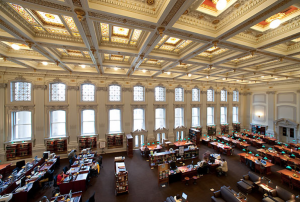 While technically just another library on campus, the Historical Society deserves a spot on this list due to the fact it is less well-known and also has beautiful architecture. If you’re stuck in the library, you might as well get stuck with a good view! The SAC, short for “student activity center” is also located on East Campus Mall. Right near multiple class buildings, the SAC is a great place to go to to fill that awkward gap you have in between classes. While mainly an open room with tables and an area with desktop computers, you can also go into the conference rooms during the day for more privacy. Depending on your study preferences, these spots are sure to provide a break from the traditional library scene. Try one and you may just love it enough to try them all!